Essex is said to be one of England’s most haunted shires. The county is home to a host of ghostly sites the most celebrated being undeniably Borley, site of the infamous Rectory. Built in 1863, destroyed by fire in 1939, and known the world over as “The most haunted house in England”. Twenty miles south of Borley, however, near the town of Colchester, lies another haunted location which many believe surpasses the incidents which are alleged to have occurred at the gloomy rectory. The haunting did not achieve the fame or notoriety of Borley Rectory yet, unquestionably it is a tale of ghosts, poltergeists, phantom women, and perhaps an evil, which, for centuries, has plagued this Essex village. For this is a forgotten ghost story; the strange case of Langenhoe. Langenhoe is situated on a slight rise above bleak marshlands near Mersey Island. The centre of the village is along the B1025 but a turning off the main road brings today’s curious traveller to what’s left of a desolate graveyard hidden by tall trees. A few solitary headstones lean in the tangled grass and weeds, and despite the proximity of several modern farm buildings there is loneliness to this remote spot. This is the site of Langenhoe church. Built in the 14th century, damaged by an earthquake in 1884, demolished in 1962, and believed by many to have once been the most haunted church in England. 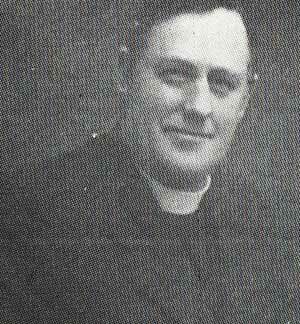 Early in 1937 the Rev Ernest Merryweather was inducted as Rector. Coming from the north of England he had never before encountered the paranormal yet soon after his arrival he began to experience strange incidents at his church. Initially these were seemingly insignificant episodes such as the Rector’s valise, a small case for carrying his vestments and books, unaccountably locking itself when left in the vestry. Every effort to open the valise proved unsuccessful in the church and church yard. Yet Merryweather found he could unlock the case when he was in the lane away from the building. However, on 28th September, 1950, while in the vestry the Rector heard the voice of a young woman singing. The sound, which resembled plainsong, emanated from the west end of the building. When the music died away the sound of a Man’s heavy footsteps were heard walking slowly up the aisle. The Rector quietly entered the church from the vestry whereupon the footsteps ceased abruptly and he found the nave empty. A week later the Vicar arrived at the church to find two workmen crouched by the west door, looking through the keyhole. The workmen beckoned to him to come and listen. Singing was heard coming from the empty church. 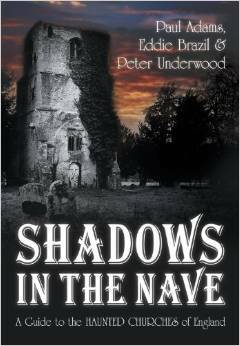 All three men then explored the building, even climbing the spiral staircase to the tower but the church was deserted. On Christmas Eve 1950, as Merryweather was walking up the nave towards the chancel, a curious vague form seemed to suddenly appear from nowhere. 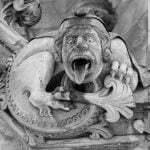 The apparition slowly glided across the nave and disappeared in to the pulpit.The Reverend describes the figure as possibly that of a man dressed in a tweed suit. On separate occasions during Sunday services, as the Rector stood by the alter officiating, he saw the figure of a woman in late medieval or Tudor dress cross the west end of the church and vanish through a wall. One day whilst practising at the organ when alone in the church he felt if as he was being watched from behind. Turning from his seat he saw the figure of a woman looking at him. She immediately vanished but Merryweather recalls her being attired in a modern cream dress. All though The Rector had not, up to that time undertaken any research into the history of Langenhoe he was later learn that the villagers had for many years considered the area as being haunted. Local legends tell of a “Lady in Black” who walks around the church at night, and an account of two sisters in 1908 who reported seeing the figure of a woman dressed like a Nun which moved slowly along the path before disappearing in to the north wall towards the west end of the church. 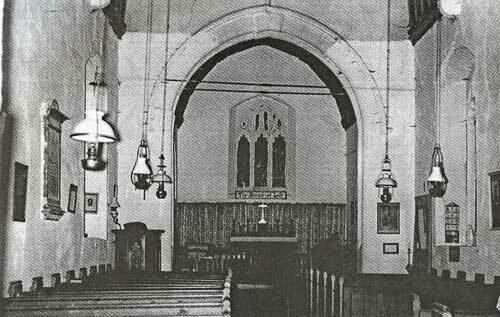 Perhaps the most extraordinary incident of the entire haunting occurred not in the church but in Langenhoe Hall. One day in the autumn of 1947 Rev Merryweather was Being shown around the house by its then owner, Mrs Cummings. On reaching a particular room the rector commented on the pleasant view it commanded over the marshes. His host however did not care for the room saying “there was something queer about it, it gave her the creeps”. When Mrs Cummings left the room Merryweather took one last look from the window before turning to follow her. But as he did so he says he had the impression of walking straight in to the embrace of a naked invisible woman. The Rector reported that the phenomena lasted only seconds but it was an unmistakable frantic embrace. There was no auditory, visual or olfactory accompaniment to the experience, yet Merryweather was emphatic it was not his imagination. Yet is there possibly a more sinister reason for the strange phenomena which has occurred at Langenhoe over the years? Does Evil stalk this region in the form of an ancient curse? Indeed tragedy and death seem to haunt this lonely village as much as the restless spirits who walk the neighbourhood. 400-year-old Langenhoe hall in particular has seen its fair share of disaster. Three people have committed suicide within its walls. In the 19th century nine children of the then owner of the hall all died in infancy, their Mother dying shortly after the last child. Albert Lowenstein, the Belgium financier, who owned the estate during the First World War, committed suicide by jumping from a plane over the English Channel. The Estate was then bought by a man who failed to make a success there and drowned himself in a sluice pipe . Soon after the First World War a driven herd of horses awaiting transportation to the continent were panicked when a terrific snowstorm struck Langenhoe. The resulting chaos caused the deaths of many of the drovers. Since then many suicides have been reported at the spot the herdsmen died. Langenhoe rectory has also had its share of misfortune over the years and has witnessed a number of curious and serious accidents, including the suicide of a previous owner. Further tragic episodes continued in to the 1940s when a young man accidentally shot and killed his fiancée in a cottage in the village. And two years before the church was demolished 72 year old Edward May died while cutting down undergrowth in the churchyard at of St Mary’s. In 1959 Rev Merryweather retired from the ministry when Langenhoe was closed and combined with the neighbouring parish of Abberton. After the furnishings and fittings were removed, the doors were locked and St Mary’s was abandoned to Rats, Mice, and perhaps its host of lost phantoms. 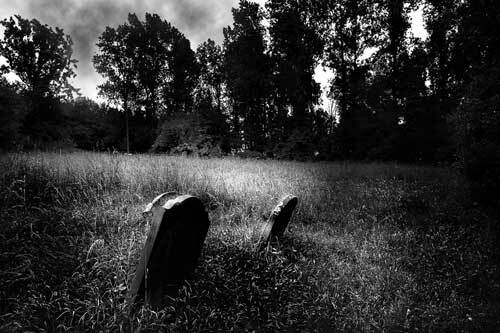 In 1962 it was demolished; its disused graveyard, now consumed by weeds and nettles, being the only reminder that a church had once stood there.Rev Earnest Merryweather passed away in 1965 and the strange events which had taken place at this lonely village on the marshes had all but faded from memory. Does the evil still remain? During the research for this article my Wife and I paid a visit to Langenhoe . Curiously, as we made our way among the gravestones, we were both conscious of experiencing a strange heady, giddiness,as if some force was sapping of our energy. My wife felt this unpleasant sensation more than I and soon became nauseous and had to return to the car. Before joining her I took a few photographs. As I positioned myself on where I figured the nave would have been I looked at old pictures of the church interior and imagined myself within St Mary’s. It was on this spot, I mused, that Merryweather had witnessed apparitions; where he had heard footsteps; the sound of spectral singing, and where, in June 1951, whilst working alone in the churchyard, had the feeling of being watched by unseen figures, and the overwhelming sensation that evil was in the air; that the Devil himself was abroad. It was enough to make him flee. Standing there I sensed there was a brooding oppressiveness gathering within the churchyard; something wholly unpleasant. With my own sensation of giddiness, and peculiar ill feeling increasing I decided to leave. The sultry afternoon had turned grey with the hint of a thunderstorm on the horizon. When I closed the gate behind me I was relieved to be once more outside in the lane. Returning to the car I took one last look back. The churchyard seemed to retreat behind its enclosing hedge as if it didn’t want or need visitors. As we drove back down to the main road it began to rain. Sadly it felt that Langenhoe church and its strange story were far away. Its restless spirits may still wander there, yet it felt that within that abandoned graveyard something else, far more unsettling, remains. in your article you refere to a Mrs Cummings at langenhoe hall, the correct meme was cutting’who was the land agent living in the house for the owner, who I think was pertwee the seed merchant and major of Colchester at onetime.. Thanks Steve wormell, langenhoe hall. I am currently putting together my family’s history and was interested to revive my memories of Langenhoe. I remember as a child in the fifties often cycling from Abberton with my mother and brother to the church armed with cleaning materials to upkeep the graves of my grandfather, grandmother and uncle (Henry Green, Emma Green and George Green). I did not then know of the church’s reputation but clearly recall the trepidation my brother and I experienced going to the back of the church to get water for the flowers. I revisited the churchyard and my family’s graves in 1999 and met Peter Wormell from the Hall who pointed out to me the field close by where my grandfather, a horseman, had died. Peter was was very knowledgeable about the area but has since died. Disappointed to find how the churchyard had been left but full of emotion and memories of those earlier days. Your account chimes with what I now remember from my family’s stories. 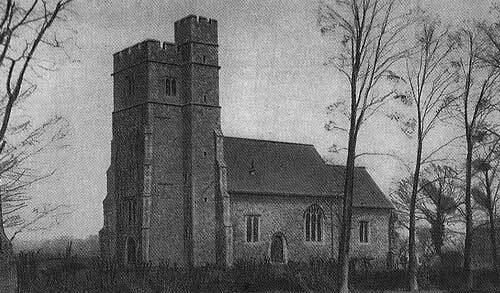 I have read the detailed account of the haunting at Langenhoe Church written by Rev John C Dening – “The Restless Spirits of Langenhoe”. This is certainly a case just as interesting, if not more so, than that of Borley Rectory and deserves to be better known than it is. Having visited the site of Langenhoe church and its long abandoned cemetery, the setting on the edge of the Essex marshes is certainly isolated enough to be worthy of a haunting. Equally, wandering around the few graves, amid the long grass and the weeds, and this was on a bright April afternoon forty years ago, I was conscious not so much of the presence of evil but of a strong sense of sadness and desolation. One other point which I omitted to make is this. That while many of the odd events associated with Langenhoe church seem to defy rational explanation, some, in my opinion, do not. In this context I am thinking of the problems of the west and vestry doors respectively slamming shut or else refusing to open. The church itself was very badly damaged in the Essex earthquake of 1884; contemporary photographs reveal how extensive this all was. Subsequently, the building underwent major repairs. It seems perfectly likely that whatever was done to restore the ancient building, no doubt lacking proper foundations, the structure was never the same again. Leading, maybe, to further movement or settlement of the building in later years, and to which problems with doors might easily well be attributed. This in no way detracts from what else the late Reverend Merryweather experienced during his incumbency as rector of Langenhoe church.